Through apprenticeships employers can upskill their workforce, learners can unlock a new career, and our country benefits from a fantastic lever for social mobility. However in order for apprenticeships to be effective they must be high quality. But what does that look like? We think it is useful to define what we mean. The Institute has just published a draft “Quality Statement” which sets out what we think an apprenticeship is (and what it is not) and what good quality looks like. We are consulting on this over the next 3 weeks and we would like your thoughts – have we got the right idea, and is there anything we’re missing? 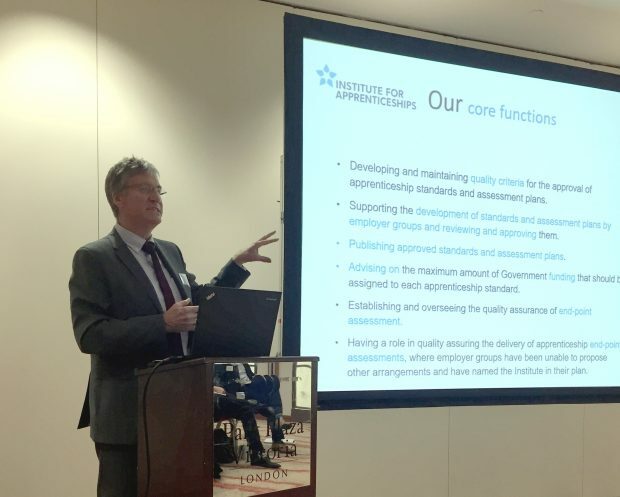 We at the Institute feel that higher quality in apprenticeships will mean greater take-up and enthusiasm for apprenticeships as an option for learners looking to a high skilled career. Apprenticeships attest to real competence and independence at work: a more secure future which does not rely on one job with one employer but provides a transferable licence for an occupation relevant to many employers large and small. For employers an apprenticeship is about “growing your own” highly trained staff who can be relied on to get on with the job competently and counted on as loyal and committed assets. An apprenticeship is a partnership between the employer, the apprentice and usually a training provider. The “Commitment Statement” is the most important document in the apprenticeship, as it embodies this partnership, setting out the related skills the apprentice already has, the terms and conditions of the job and a carefully drawn up and comprehensive training programme. So what does a good quality apprenticeship look like? We think it is based on an occupation which is common to many employers, is truly skilled and takes some time to learn. It includes formal off the job and on the job training and the support of at least one designated person at work. This is written down in a “standard” approved by the Institute which clearly describes what the apprentice will be able to do at the end of their training. The job itself will include terms and conditions which meet the legal and contractual requirements for an apprenticeship and which offers (with the training) opportunities to learn all of the skills and knowledge required by the standard. Most apprentices continue in a permanent job with their training employer. If they do not then we expect the employer to want to do all that they reasonably can to secure a future career for the apprentice after their training. The training programme for the apprenticeship should be at least one year long (and usually much longer) including a fifth of this time on off the job training. This could be a “day release” course or a less formal programme of off the job training closer to the working environment. This programme must be provided by a training provider or college on the Register of Apprenticeship Training Providers and subject to successful inspection by Ofsted. The apprentice will be assessed at the end of the apprenticeship by a highly competent assessor accountable to an assessment organisation on the Register of Apprenticeship Assessment Providers and quality assured by the Institute’s arrangements. The assessment will determine whether the apprentice is truly competent to perform the occupation. If you are an employer then we want you to sign up to the Quality Statement for your apprentices and staff. We want you to use it to communicate with your training provider exactly what you expect from them. If you are a training provider then we want you to use the statement as the basis for your strategy to deliver quality and to tell employers that this is what you believe in. If you are an apprentice then what is in this statement is what you should expect from your employer and training provider. We all have a stake making sure apprenticeships are high quality, and we need to make sure we are all aiming for the same goals. The Institute will use the Quality Statement as the basis for its strategy to achieve high quality and we will base all of our actions and developments on its content. So first let’s get it right. Please let us know what you think of our draft. The consultation closes on 18th October, after which we will assess responses and publish a final statement.